Mohamed Nasheed's supporters plead for his release. Political crisis in the Maldives puts New Delhi in a position where it has to act. But how? Political crisis is brewing in the Maldives. How should India react? Over the weekend, Maldivian police forcibly dragged former president Mohamed Nasheed to court for a hearing regarding politically motivated terrorism charges, injuring him in the process. Nasheed, stripped of his dignity as leader of the opposition, was offered a hearing before a panel of judges sympathetic to the interests of the ruling government. The country’s first democratically elected leader, Nasheed currently leads the opposition in the Maldivian parliament against the incumbent government of President Abdulla Yameen. 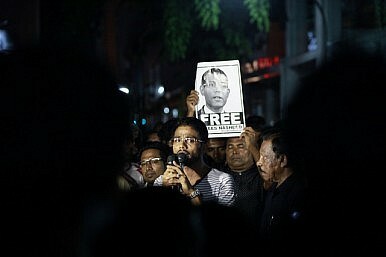 Following his hearing, Nasheed was incarcerated. If convicted by the government under the Prevention of Terrorism Act of 1990, he could face a prison term of up to 15 years. The Yameen government’s approach to Nasheed’s trial represents a fundamental subversion of democracy and necessitates a serious and measured response from New Delhi, the major regional power. New Delhi’s first impulse was to issue a statement of “concern” regarding Nasheed’s treatment by the government. That statement drew a sharp rebuke from Yameen’s government. The Maldivian foreign minister, Dunya Maumoon, in responding to New Delhi’s statement, noted that Male “will not take instructions from a foreign government.” The current government regards any potential Indian interference in the island’s politics with a great deal of skepticism. New Delhi has in the past taken a stand on Maldivian politics. For example, Nasheed spent almost two weeks holed up in the Indian High Commission just a year ago, fearing exactly the sort of treatment at the hands of the government that he is experiencing today. New Delhi intervened then, allowing the former president to use its diplomatic mission as a refuge. The Indian External Affairs Ministry, eager to avoid any perceptions of undue Indian interference in Maldivian domestic politics, noted that Nasheed had taken the initiative in approaching India. Events in the Maldives this past week have clearly supplanted New Delhi’s wishes. India should realize that it can take action to preserve the Maldives’ fledgling democracy without outright expressing a political preference for Nasheed’s leadership. The incumbent government is slowly starting to see its support base wane, and perceptions of the regional power backing the opposition could drive the government into autocratic overdrive. Despite the political fragility and complexity of the situation, there are a range of actions New Delhi can pursue. The bluntest option in India’s toolkit is to implement economic sanctions against Male. The previous Indian government implemented travel restrictions and some economic sanctions after Waheed’s “coup.” Sanctions can be a particularly effective coercive tool against small island nations with limited resources. New Delhi, however, should be careful before rushing to implement sanctions. If improperly calibrated, sanctions could prove too harsh and lead to a rise in anti-India sentiments in the Maldives. India, given its proximity, size, and diplomatic history with the Maldives, is a major trade partner. In recent years, development assistance to the Maldives has comprised as much as 5 percent of India’s total international development aid budget. Additionally, New Delhi has provided several loans and grants to the Maldives following the island’s formal transition into democracy. Suspending these projects could twist the screws on Yameen’s government and discourage any straying from democracy. New Delhi will likely attempt diplomacy before reverting to sanctions. One report in India’s Economic Times notes that New Delhi has already put plans in place to dispatch a senior diplomatic envoy to Male to evaluate the situation. Additionally, Indian Prime Minister Narendra Modi is scheduled to visit Male this spring. One way to send a message to Yameen’s government would be to either postpone or cancel the prime ministerial visit. This is not without precedent from New Delhi. For example, under pressure from Tamil legislators and other interest groups, former Indian Prime Minister Manmohan Singh ended up canceling a scheduled visit to Sri Lanka for the Commonwealth Head of Governments Meeting (CHOGM) in 2013, sending a message to Sri Lankan President Mahinda Rajapaksa’s government. A third option is for New Delhi to take initiative in leading the international response to the Maldives’ political crisis. Already, the United Nations and European Union have urged fairness, transparency, and judicial independence in the legal process against Nasheed. No doubt interested international parties will turn to India as a potential interlocutor with the government in Male. New Delhi should not hesitate to internationalize its response to the crisis. A complicating factor in New Delhi’s calculus will be the potential for an adverse diplomatic response to foster a longer term strategic divergence between New Delhi and Male. The Modi government has clearly stated its desire to focus on developing India’s leadership within its immediate neighborhood first. The Maldives, meanwhile, aren’t absent from the radar of other major Asian powers. Most notably, China has expressed interest in developing its relationship with the Maldives. On his South Asia tour in the fall of 2014, Chinese President Xi Jinping stopped in Male, signaling an interest in incorporating the nation into China’s 21st Century Maritime Silk Road (MSR) initiative without any political preconditions. Additionally, the Chinese reaction to the ongoing political crisis has been complete stoicism. When asked by reporters for China’s take on the current political crisis, Chinese Foreign Ministry spokesperson Hong Lei simply remarked that the issue “is the domestic matter of the Maldives.” “China upholds the principle of non-interference in other countries’ domestic affairs. We believe the Maldivian side can deal with its domestic affairs properly,” he added. Indian strategists continue to express concern about China’s forays into the Indian Ocean — a region that they see as India’s strategic backyard. Yameen’s government will be buoyed by China’s reluctance to let a reversion to autocratic practices affect bilateral relations. Rajnath Singh, the former president of India’s ruling Bharatiya Janata Party (BJP), once remarked when in opposition that India’s Congress-led government had a foreign policy so weak that “even smaller countries like Maldives are giving India a hard time.” Today, it will be up to Modi to architect an effective diplomatic response to stall a backslide in democracy in the Maldives. There are good strategic reasons for New Delhi to make this a priority right now. Given the Modi government’s political circumstances, much energy will be spent on successfully navigating the release of a new budget and other domestic political issues. Still, inaction as democracy retreats in the Indian Ocean will only damage India’s interests and image as a regional power. Relations between India and the Maldives have had their highs and low. The two countries cooperate closely on security matters — India has, for example, helped the Maldives set up its coastal surveillance capabilities. Most recently, India was the first responder after Male’s only sewage treatment plant suffered a fire, leaving some 100,000 without access to safe drinking water in the Maldives. Additionally, India is a major economic partner for the small island nation in the Indian Ocean. The relationship has faced its trials in the past as well. For example, relations declined precipitously after the Maldives canceled a contract for major Indian investment in an airport due to a change of leadership. That incident, which ended the single largest foreign direct investment offering the Maldives had seen at the time, damaged relations for some time.